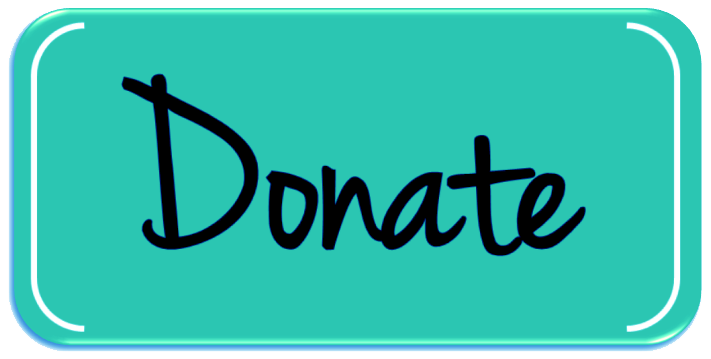 Lost Creek Ranch is a 501(c)3 Non Profit horse rescue that was founded by Lynette Weldon and is run with the help of volunteers under her direction. 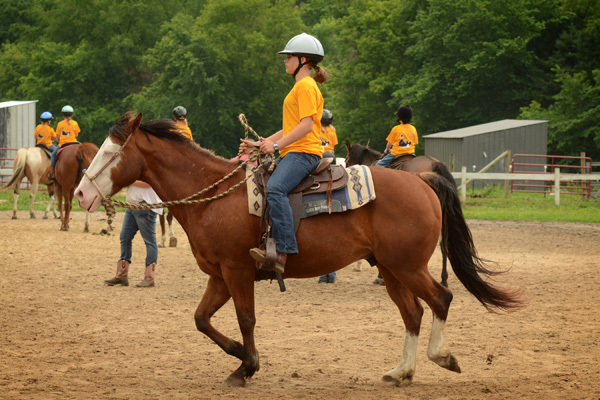 We rescue, retrain and give our horses a forever home and job working in one of our programs like Camp Confidence, teaching lessons or taking riders to shows. Lost Creek Ranch is unique among rescues being founded and run by a professional trainer and giving our horses a home for life and a job. Handling and training rescued or abused horses requires an experienced trainer and it is one of the things we are most proud of here. Our Mission "Let no heart or soul , human or equine, fall through the cracks." is really more than just words. It is how Lynette Weldon lives her life and it is why the ranch exists. Her strong belief that has every life is valuable and that everyone deserves a second chance has guided her in setting up programs. Every rescue horse at the ranch has a job. Even the senior semi retired horses like Blizz, Bandit and Tardy are used for timid little ones to learn to groom and lead. The ranch is often the last stop for a horse that has had a run of bad luck and been labeled "dangerous" or "crazy." The most dramatic changes are seen in these horses. After establishing leadership and building trust It doesn't take Lynette long to have them safe and sane and ready for their new job. Not only is Lost Creek Ranch a place for equine lost souls it is also a respite for people who needs to build their confidence, make new friends and find a place to belong. The atmosphere Lynette has created is unlike any other riding establishment. 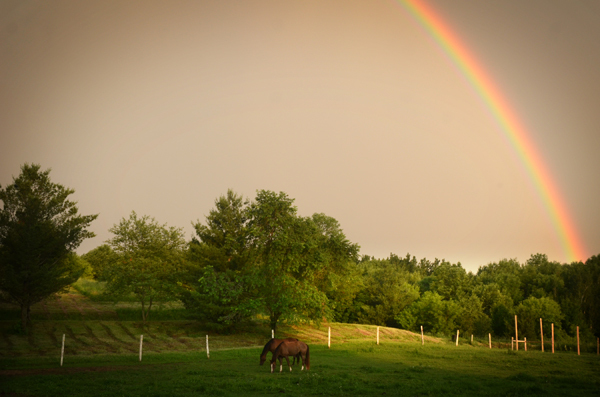 Everyone is welcome at Lost Creek Ranch and everyone will find their perfect equine partner. Our ranch is home to the happiest horses in Pierce County! Our property features large paddocks with run in sheds, small group turn out as well as individual turn out. 120x250 outdoor lighted outdoor arena, 72x110 indoor arena. Barn with spacious stalls available for training horses or horses in rehab. Heated lounge, bathroom/shower, heated/ AC bunkhouse that accommodates 10. Picnic grounds and fire pits. 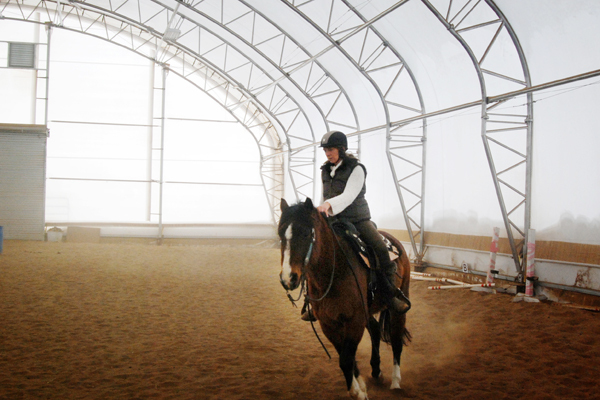 Riding inside our light, bright arena on a cold winter day. View from the middle of our large outdoor arena. 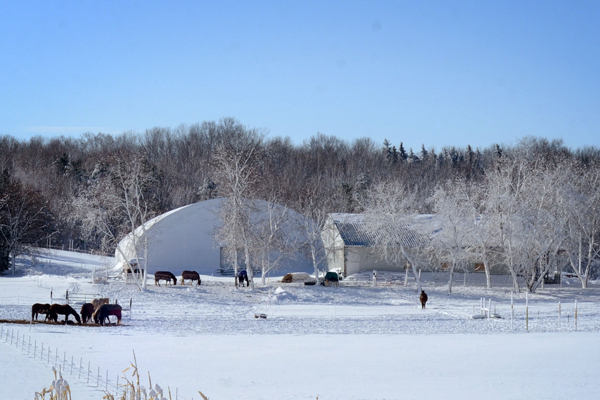 Winter view of paddocks, indoor arena and barn. "Let no heart or soul, human or equine fall through the cracks" is what we live, teach and practice every day at Lost Creek Ranch. We aim to teach not only good riding skills but to inspire a lifelong love and respect for horses and horsemanship. Every horse has something to teach at Lost Creek Ranch. As part of our mission we have a show team that works hard all year training with correct and classical methods that always put the horses well being first. If you are interested in learning more about our show team come visit us. We strive to improve with every show and our riders have a special interest in the art of Western Dressage and Classical Dressage because of its ability to develop a healthy, happy, sound working horse. 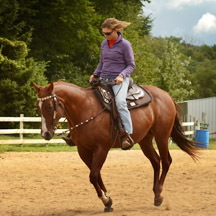 See more about Western Dressage here. 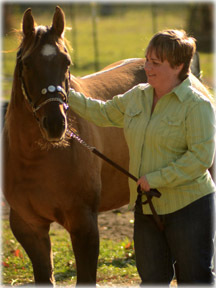 Lynette Weldon specializes in creating strong, confident riders and respectful, willing horses. Lynette's riders often joke that she is "half horse" because of her instinctual ability to understand what is going on between horse and rider. 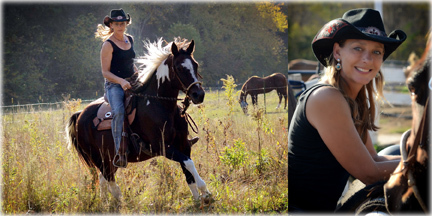 Lost Creek Ranch was founded on her strong belief that the horses needs come first- that horses are not just tools. It is this horse-first attitude that attracts riders from beginner to accomplished equestrians looking to further their skills. 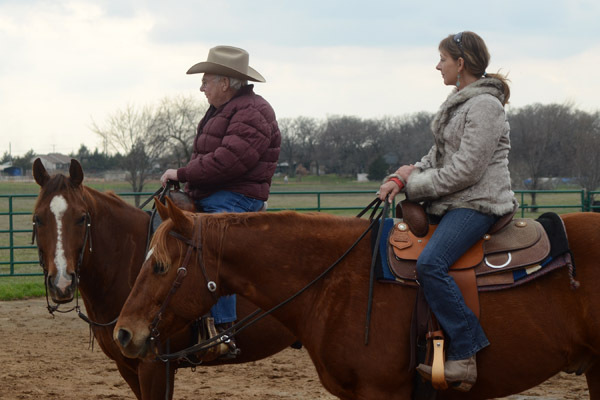 Everyone finds a place at Lost Creek Ranch and every horse that becomes part of the herd is trained by Lynette for a job they will excel at whether is it competing in the show ring, or building riders confidence as lesson horses. Growing up Lynette cleaned stalls in exchange for riding time on horses that often no one else wanted to ride. These horses were excellent teachers. As an adult with family responsibilities her horse budget still did not allow for well bred high quality horses. In the long run this is how she became an accomplished trainer: by taking average horses and turning them into well trained, beautiful, willing partners. 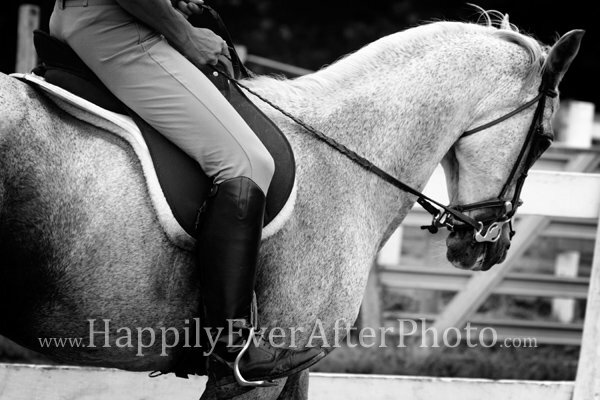 Her horse-first philosophy leads her to train using no short cuts, games or gimmicks- just real, honest horsemanship. 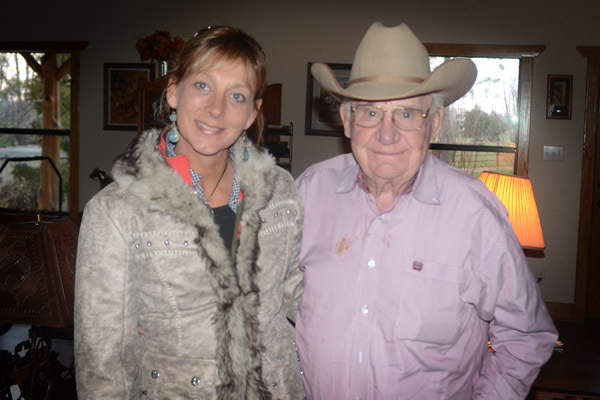 Her training influences tend to be the greats from another generation including Buck Brannaman, Tom Dorrance, Ray Hunt, Frank Bell, Sally Swift and the inspiration for western dressage Jack Brainard. The welcoming atmosphere Lynette has created at Lost Creek Ranch attracts clients from all over western Wisconsin and the Twin Cities who are eager to learn and advance their skills and enjoy the quiet refuge that is Lost Creek Ranch. 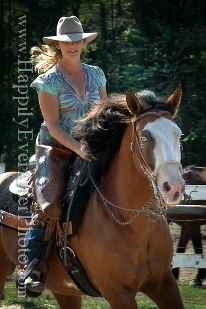 Lynette rides and trains both Western and English horses. Lynette riding with Jack Brainerd- one of the early promoters of Western Dressage- at his ranch in Texas. 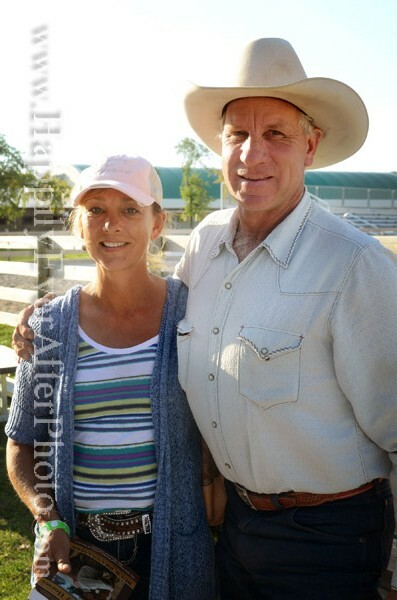 Above Right: Lynette with her long time training inspiration Buck Branaman. Lost Creek Ranch is a 501(c)3 non profit horse rescue dedicated to our mission: "Let no heart or soul, human or equine fall through the cracks." 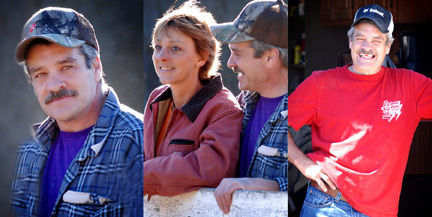 Each of our Board Members bring their own unique experience and perspective to the ranch. and competes in Western Dressage on! Our volunteer staff and interns are an important part of our success! 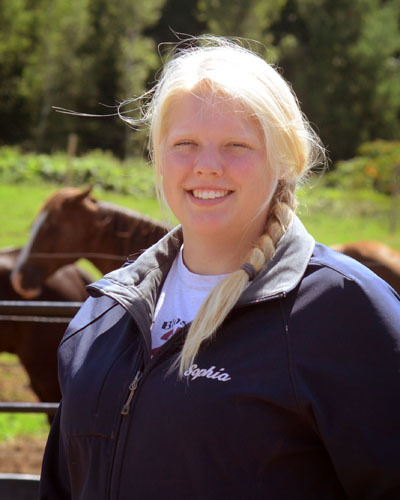 Sophia has been Lynettes student for four years and believes in all her philosophies about natural horsemanship and proper equitation and teaches her methods to every camper/student that she has. She has introduced 400 campers to riding and her dream is to one day be an accomplished vaquero trainer and her favorite horse activity is ranch sorting. Sarah grew up in Eau Claire, WI. 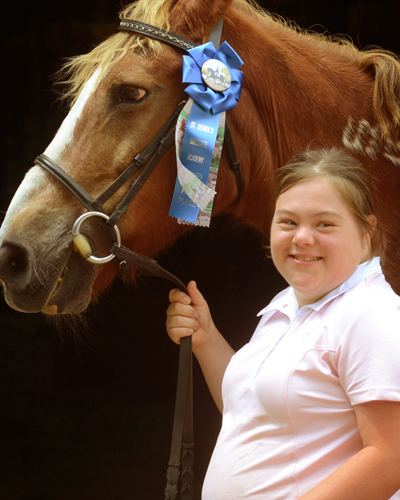 She has three horses of her own and knows the value of a "golden oldie" school horse to learn on. Sarah was a member of her schools rodeo club and also has volunteered at the animal shelter in Eau Claire playing and working with the dogs and puppies. She is currently studying to be a certified vet tech. Sarah has an excellent work ethic, is always willing to lend a helping hand and is a valued member of our ranch family. She is currently learning to train under Lynette and has been assigned one of our more difficult project horses: Bubba but for fun enjoys riding Nalla, Nickers, Benny and of course Dillenger. Jordan is Lynette's daughter and an enthusiastic member of our team! She works in the office and helps with ranch events and does an excellent job promoting the ranch at expos and community events. She is also a proud member of the Lost Creek Ranch show team showing her new mustang King in dressage. They are a great pair and he would do anything for her. We could not do what we do without the support of our volunteers. Our herd stays fat & happy thanks to their loving care. Our Students: We are blessed with students who never want to leave and are happy to muck stalls, feed the horses, stack hay and fill tanks. Adrianne: Blanket repairs. Thanks to her our horses stay warm and cozy all winter. Grandpa Scott- every week while his granddaughter rides in her lesson Scott finds projects to work on around the ranch and we very much appreciate it! The Ahlers Family- we couldn't have moved 30 horses without your help! Josalin- who even loves helping with chores! Jason- Jenns hubby who puts in more time and has sustained more non horse related injuries than anyone! Our wonderful fencing guy who keeps our herd contained! Amy the "rock doc" for her continued support. Heather whose horse expertise was invaluable on moving day. ... and many more I am sure I am forgetting! Lynette's husband and best friend. Kevin was always active behind the scenes at the ranch and is missed dearly. 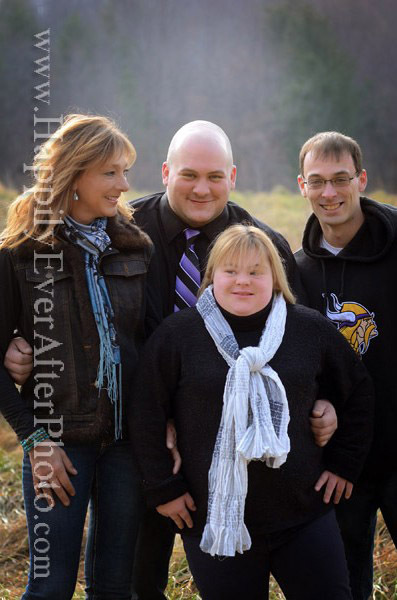 Lynette and Kevin have three adult children: Joe, Justin and Jordan. Jordan lives at home with her cat Jack and enjoys riding her horse King when she is not at work or singing. The rest of the herd includes Mack the black lab, Joker the German Shepard and Derby- the little guy who chases Mack around all day and the newest little dog Addy. Tinker and Birdie (cats) round out the herd. Have you always wanted to learn to ride horses? This is the place for you! 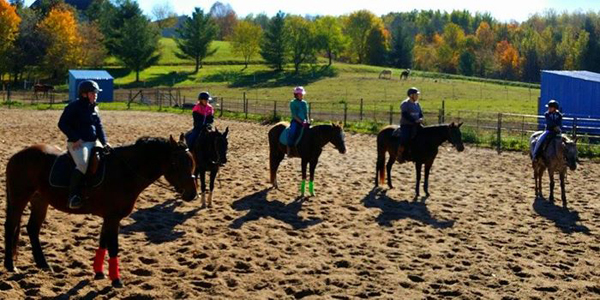 Riding instruction,the best horse riding lessons in Wisconsin, near the Minnesota border. 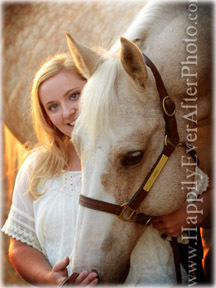 Horseback riding lessons WI, MN for kids and adults: western riding lessons WI, MN, English riding lessons WI, MN and the best Horse Camp in WI, MN. Learn to ride horses at Lost Creek Ranch! 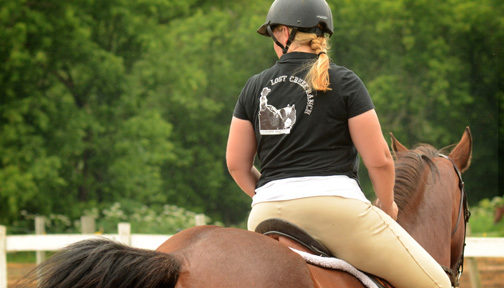 Lost Creek Ranch and Lynette Weldon offer western dressage lessons and clinics in Wisconsin and Minnesota. 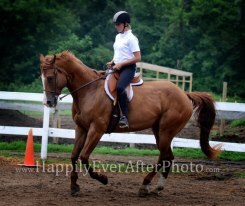 Western Dressage WI. Western Dressage MN. Western dressage Clinics. Western Dressage Training WI and MN. The best horse camp! Mini camps and full week long camps. Come out and see which horse is right for you!